Another low scoring thriller, Thanks to Sunrisers Hyderabad for making it happen. Delhi Batsmen never got going on a flat pitch and continued to loose the wicket at wrong time to make it worse. No one got going which eventually meant they scored just 115/8 in 20 overs. Chasing a easy target Sun Risers made sure crowd got the money’s worth and produced a meaty chase with pathetic display of batting and almost threw the match away. Until Amit Mishra who is also a recent double centurion in Ranji Trophy ensured Sun Risers scrambled through the line of victory. – Dale Steyn & Siddarth Kaul respectively bowled the 4th & 5th Maiden of this season. – Siddarth Kaul becomes the first bowler to bowl a Maiden in IPL history. – 145 runs was the lowest score defended in Feroza Kotla and it will remain to be as Delhi Missed a great chance of changing the tides and getting into points table. – Dale Steyn’s spell of 4-1-11-2 is the most economical spell in terms of runs conceded. – Thisara Perara had faced only 2 balls in 27 minutes which was the highest time taken by any batsmen spend facing very fewer balls. – 50 runs scored in 65 balls is the slowest by Delhi in any season of IPL. – This second time Delhi has lost four matches in a row in 6 seasons of IPL. Match 33, Bottom of the table Delhi taken on Kolkata in an important game, Delhi Bowled much better than any other game so far in the IPL, which restricted KKR to 149 in 20 overs, Without doubt Shewag was the happy man at that moment, But Shewag couldn’t keep his content for long, as his team gave wicket in regular intervals to lose the momentum and finally falling 17 runs short. Which gave KKR a imp 2 points to go up to the place 2, and unfortunately Delhi will still hung in the bottom of the table and they will be needing min of 5 wins out 7 have in hand. – Yusuf Pathan played his 50th IPL game and Travis Brit made the IPL debut. – It took 26 overs to have a spinner bowl today… Without doubt a surprising fact and Delhi becomes the first team in this season to finish of their bowling without even bowling a spinner. 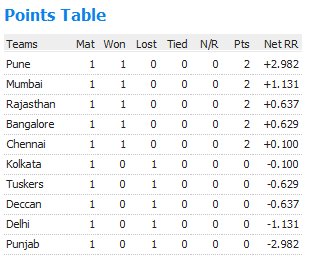 – Gambhir, Shewag, & Venugopal Rao went past 200 runs in this IPL. – Irfan’s 4-0-16-1 is his second most economical T20 performance in 75 games, when he has bowled 4 overs. The last time he did it was in the 2007 WT20 final. 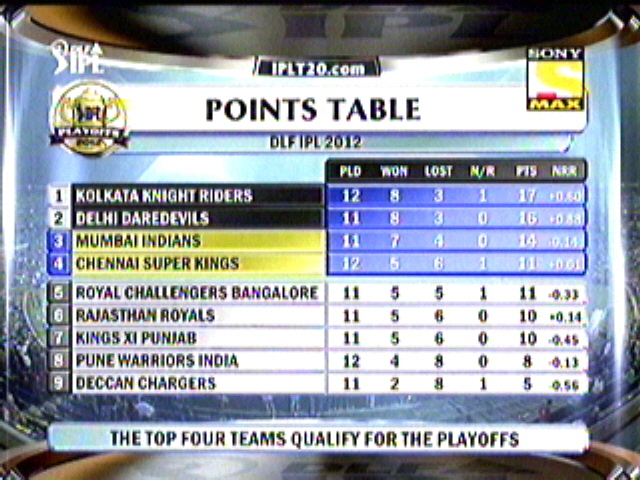 – This is the first time Delhi has lost 5 games on a trot in an IPL season. – 13th game won batting first in IPL season 4 and 19 games won batting second, hopefully trend of winning the toss and chasing is changing. No more turning back for Chennai as they have to win this match to say atleast they in the contention for the semifinals. 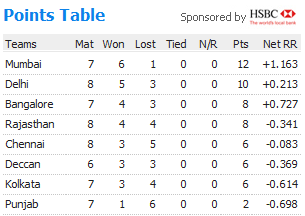 On the other hand, its Royal challengers having a galla time, winning 4 games out of 6 and in the second position of the table. In the chennai’s rising heat, Kumble won the toss and decided to bat first, Thusara and Gony started the things, and Thusara gave a vital break by removing Manish Pandey early. Later in the next over Gony dropped a S I T T E R of Uthappa, where he himself got punished by him taking for 19 runs. At the end of powerplay overs RCB where 52/1… This is the time spin duo came into play (Murali and Jakathi), both bowled really well, made the ball to grip of the surface and skid before the batsmen play their shots. Uthappa wsa the first victim to Jakathi, mistimed one to long on. Kallis and Kohli kept the things going slowly and didnt allow any wickets to fall in the middle overs. Turn around of the match u call it, Its 16th over of the match as Jakathi picked Kohli in the first ball and third ball Kallis was run out, and further in the over no runs are scored, which gave the first ever double wicket maiden for IPL. Late surge from Pieterson and White(their first IPL game of this season) got them to a score of 161/4 in 20 overs. RCB 161/4 in 20 overs. CSK 166/5 in 19 overs. CSK WON THE MATCH BY 5 WICKETS. A Must win situation for Chennai infront their home crowd, Murali Vijay took the roll of aggressor, as he balsted 24 runs of Praveen’s 2nd over. Hayden was mere an audience with another 40,000 in the ground. At the end of 3 overs, Hayden faced just one delivery where he scored just a bye. on the other hand Murali had 37 runs. Both Hayden and Vijay continue to go past the 50 run partnership, but RCB skipper pulled himself back to remove haydos, Raina joined Vijay and runs continued to come from Vijay, he took Pieterson for 2 sixes and adrenalin rush took him and he mistimed one to long on. Dhoni and Raina just nudged singles and made suer, RCB dont make inroads easily also made sure they get that odd boundary every now and then. A big upset came when Dhoni and Morkel departed in quick succession and Kumble charged up and tried to pull the game out of the hand of CSK. Crucial 19th over was bowled by Vinay Kumar as CSK needed 16 to win. Badri got boundary in the 4th ball, to add twist to tale he was out the very next ball. Needing another 10 to win in last 8 balls, Chennai crowd got the glimpse of previous match with KXIP (me too), But Vinay kumar faultered at the important moment as he bowled a no ball and raina thrashed it to a six, the very next ball (free hit) also a no ball, and raina scored 2., which meant CSK won the game, but no one realised it, but to make perfect, raina smashed a boundary past mid on to seal the game for Chennai. Both the teams with 8 points, will look to take the vital lead, Gambhir won the toss and decided to bat first, last match centurion and shewag walked down, Shewag started off in the typical fashion, starting with a six and and followed by a boundary, When both the openers are abt to be settled, Narwal the bowling change worked as he picked both the openers in the space of 3 balls.. and very soon, Collingwood made a mess of a run to see himself back to pavilion, after a brief stay jadhav also departed for delhi, scorecard read 70/4 in 9 overs, with rajasthan in full control, in came Dinesh karthik alongside the skipper gambhir, both played an excellent innings to get delhi back in control, late fire power from karthik and mcdonald made sure delhi got a very defendable score of 188/6 in 20 overs. DD 188/4 in 20 overs. RR 121/10 in 17.4 overs. DD WON THE MATCH BY 67 RUNS. Chasing 189, Rajasthan had their worst start ever, as two of their batsmen back to hut in the space of just 4 balls in first over, delhi crowd went berserk. From then on, its almost a one sided game, as Rajasthan tried to peek a look over target someone got out to pull back, it kept happening, as Ojha top scored with 27 and yusuf with 24 with a survived chance.Delhi was brilliant in the field as they held anything came their way, except for a tough chance to collingwood, David warner in spl, took 4 catches and inflected a run out with a direct hit. Eventhough Delhi didn’t have Nannes bcos of injury, Maharoof filled his shoes perfectly. Mishy bowled really well his spell and picked three important wickets, including one big fish Yusuf pathan.. In the end RR fell well short of the target with 67 runs. – 56/0 is the best score by chennai for this sesaon of IPL in the first six overs. (Finally a partnership clicked). – 78 is the best performance by Murali vijay, bettering his previous best 42 scored in last match. – Jakathi bowled the third maiden of this tournament. And first double wicket maiden. 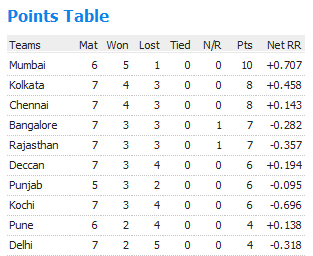 – Last 14 runs scored by chennai was done with just 1 accountable delivery. (Vinay Kumar bowled two no balls). 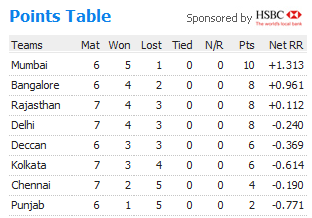 – 74 extras conceded by CSK in 8 matches is the highest ever by any team. – J.Kallis took the Orange cap back from Sachin, (Now sachin didn’t have to wear Orange cap with blue unifrom :D). – Kallis scored his 4th fifty of this season and 12th in his T20 career. – 67 runs victory margin is their biggest, bettering the previous best of 40 runs margin in the last game vs KKR. – Amit mishra is now with Muralitharan for most no.of wickets with 11 each. Orange Cap – J.Kallis (362) followed by Sachin Tendulkar (314) and Yusuf Pathan(274). Purple Cap – M.Muralitharan (11) and Amit Mishra (11) followed by S.Malinga (10) and Shaun Tait (10). DD 177/4 in 20 overs. KKR 137/9 in 20 overs. DD WON THE MATCH BY 40 RUNS. In a pitch that slows down as time goes on, KKR started chasing 178, start wasn’t so ideal, as Dada walked across the line to run it down third man boundary but ending up losing the leg stump. Followed Mandeep Singh, Followed Manoj Tiwary to pavilion along with the skipper in another space of 10 balls. KKR would have fancied seeing DD who bounced back after losing first 3 quickly, indeed they had two of the best batsmen out in crease, Gayle and David Hussey, who could win them the game, Gayle got the boundary every over to keep a check on the run rate, but its always in the cards, he lofted one to long on of rajat bahtia and this time mishra holded to it. (Shewag dropped him earlier) Hussey and yadav played out but couldn’t control the run rate by any means it crept to 15 per over when hussey mistimed a fulltoss. From then on, nothing more to pen as all walked to paly out 20 overs and they did successfully in doing it. and fell short of 40 runs… Handing a biggest victory margin for DD. 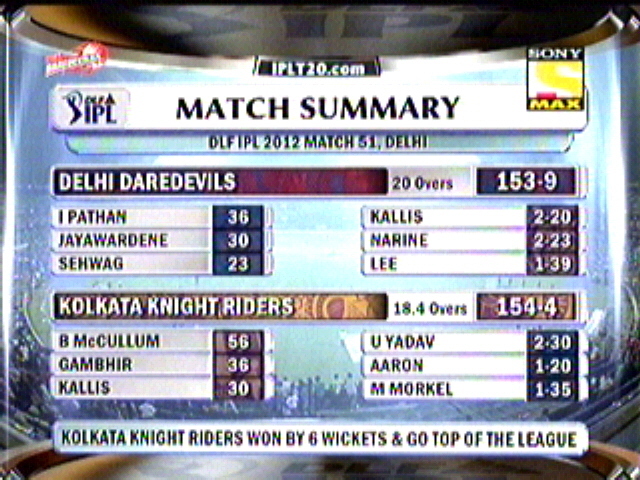 – Biggest win for DD in IPL, also their first home win of this year. – David Warner scored the 10th IPL century, 2nd of this season and which is also his first ever in IPL. – David Warner also becomes the highest scorer of this season as of today, with 107*, overtaking, Yusuf’s 100. – 26 balls without boundary is the highest for this season. – 128 run Partnership is the best ever 4th wicket partnership in IPL. – Both Adam Gilchrist and Dinesh Karthik head to head in the most no.of dismissals effected by a wicketkeeper. Both tied as of now with 7 each. – Warner Hit the 250 six of this IPL tournament. – with 25 fours Ishant tops the list of boundary givers. Orange Cap – J.Kallis (310) followed by Sachin Tendulkar (303) and Yusuf Pathan(250). Most Sixes – Yusuf Pathan (19) followed by Hayden and Uthappa with 12 each.